This burger, (a real menu item at Mel's Country Cafe in Tomball, Texas) consists of five pounds of beef, one pound of bacon and a quarter pound of cheese. This would not be on the menu for Eating Better Forever. If you’ll recall, I’ve been looking to drop a bit of poundage. Nothing radical. I’m just trying to skim about ten to fifteen pounds off my frame. Thing is, I want it off permanently. I’ve been losing (and gaining back) the same 15 pounds since I was a senior in college. At 35, I want to set a goal weight and then actually maintain it. I want to Eat Better Forever. I know that as I get older, a pound or two might stick around from year to year. Considering that, I’d like to march into middle age at a comfortable weight, leaving a little wiggle room for the inevitable. It’s been a week or so. I haven’t had ice cream in bed while watching Will and Grace. I haven’t had ice cream at all. I’ve made it my business to make my lunch in the morning: a turkey sandwich and plenty of snacks to get through the day. And I’m trying to do better about drinking plenty of water. I threw a few packets in my desk at the office, put some in my glove compartment and put the rest in my kitchen. Instantly, I doubled my water intake. The lemonade satisfies my sweet tooth with like, five calories. Yum! Two days after I started my Crystal Light project, (keeping in mind that I only had one packet a day), I had a horrible, dull headache that would not go away. I’d take three Tylenol. And it would lessen but not disappear. A few hours later, the headache was back with a vengeance. I Googled “crystal light” and “headache” and got 20,000 hits. The aspartame in the drink seems to cause massive headaches for many people. I shudder to think what this poison is doing to me if it affects me this way. I’m now squeezing lemon and a drop of agave nectar in my water bottle. Damn that Crystal Light mess. Stay away! This joint right here is the truth. It’s got eight grams of protein and 20% of the fiber you need for the day. Essentially, that means it fills you up. I have one of these during my Danger Zone, between lunch and dinner. The best part is that it’s got a layer of chocolate on the bottom. Not enough to really hurt. But just enough to feel like a treat. I’ve read that energy bars should be handled with care. You feel like you’re eating healthy so you eat ten of ’em. Not good. So be conscious of that. But I’m telling you, pick these up, you won’t regret it. I cop mine at Whole Foods and they’re a little over a dollar a pop. I’ve seen ’em at Target too. Heaven. For real. And it is FAT FREE. Zero fat! I didn’t think anything could replace the creamy deliciousness of my beloved ice cream. But this actually does the trick. It’s delightfully creamy and the intensity of the fruit is insane. And for some reason, I eat less sorbet than I do ice cream. I’m not sure why because I know it’s less filling. But sorbet sticks around our freezer a lot longer than a pint of ice cream. Maybe there’s a Greed Decreaser ingredient inside sorbet. It comes in a mango flavor too. But that’s a little too sweet for me. Can’t wait to try the lemon flavor though! Kale chips! Don't knock 'em til you try them! Okay. I know this is going to sound crazy. But work with me. Tog, like most two year olds, isn’t crazy about vegetables. She’ll eat the occasional carrot. Maybe a spoonful of peas. But it’s tough. I read a kid’s cookbook and found a recipe for chips made out of kale, the super leafy green veggie that’s similar to spinach. Well, my kid would starve before she’d eat some wilted icky cooked kale. And she’s not yet ready to eat raw veggies. But if you take some kale, cut it from the stem, rinse out the leaves and simply lay them out on a cookie sheet and bake at 350 degrees, something wondrous happens. It gets crispy. Super crispy. Like a potato chip! And you can’t tell Tog she’s not eating a bag of Doritos when I throw some kale chips in a brown paper bag. If you drizzle the kale with a tiny bit of olive oil, salt and pepper or a few tablespoons of your favorite oil-based salad dressing, YUM. The “chips” are salty and flavorful. Try the recipe. You will not be disappointed. I know it sounds crazy. But it really is good. But Eat Better Forever is a marathon, not a sprint. So I refuse to beat myself up over missteps. Each day, each meal, I get a new chance to do right by my body. And you do too! dear readers: What can you recommend for me and my Eat Better Forever campaign? Have any healthy recipes that are super tasty? If you checked in on my last post about eating better, I’d love to get an update on your progress. Hanif, are you still dipping out for fast food before going home after work? Jovie, are you still hitting that Wii? Kimberly, you commented that you were joining Bally’s in the next two weeks. Did you do it? Yolanda, Tanisha, Lashonda? How’s it going? Kimmie, your comment in my post about losing weight resonated with a lot of people. How are things going? Fellas? Kenny, Jay? What’s going on? and a Diet Coke? Really?!?! This entry was posted on March 13, 2009 at 11:19 am and is filed under Eat Better Forever, Uncategorized. You can follow any responses to this entry through the RSS 2.0 feed. You can leave a response, or trackback from your own site. As soon as I saw those Crystal Light packets, I groaned. Instant migraine every time. I can’t chew sugarless gum, drink diet soda, or any of that junk. For sweetners, I stick with agave nectar and honey. MSG is poison for me too. No real tricks or tips. I use sea salt instead of regular, olive oil instead of butter, try to stay away from prepared foods, etc. at home. I love to restaraunt hop, though, and who knows what Legal Seafood and Cheesecake Factory are putting in their dishes. So I figure at the end of the week, it’s a wash healthwise. I will try the kale chips. I tend to stick with spinach and brocolli. I could use something new. You should try looking into Weight Watchers. I’m a big foodie but this diet has really kept me in line. Did you also see Wednesday’s Oprah where she had the cooks come into people’s homes and try and cook healthfully and cheaply? Those recipes seemed easy and quick to do. The shopping list and everything you need is on Oprah.com. Well I’d like to think I’m doing better. I still keep a Fiber One bar in my purse at all times. (Try them!) The apple ones make me feel like I’m having a sweet treat. I’ve been eating pretty well, but I did indulge my sweet tooth with some Twizzlers at the movies the other day. (Milk was good; its on DVD Aliya) Today I haven’t had anything to eat. Just two cups of water. I’m about to go pick up lunch; chicken salad and tomato soup. I probably won’t eat again until dinner, which I already know will be a salad with grilled chicken. I’m still swimming three times a week although I think I’m still being a bit lazy and could step up on the exercise. I’m not “there” yet, but I vow to continue to make the effort. I had to slow down on the aspartame containing drinks too Aliya. I make my own pitchers of brewed green tea, sweetened with Stevia (try it) and fresh lime juice, fill my go cup, and go. I buy a fresh pineapple once a week, mix it with fat free organic vanilla yogurt and all natural granola. Top it with fat free cool whip and you’ve got yourself a bootleg parfait. Yes! Kale chips! That is a classic Siegler food! Like Tanisha, I also eat fatfree yogurt with fruit–I like berries in it for a snack or “dessert”–haven’t tried vanilla yogurt, I usually go for plain. Best when berries are in season obviously. 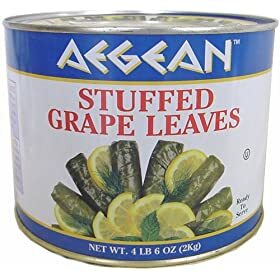 Also, like Katura, I tend to stay away from prepared foods when possible (though restaurants do kill it), but I do eat canned dolmas for snacks–you know, those Greek stuffed grape leaves? There’s a particular brand I love called Aegean, pretty widely available–photo here: http://ecx.images-amazon.com/images/I/51WMSNJVBML._SL500_AA280_.jpg. They’re about 40 calories each I think, and not low-fat by any stretch, but honestly one or two are very filling and satisfying if you’re not looking for sweets. Phil and I had a lot of success losing weight eating soup. We have about 100 million vegetable soup recipes that are nearly fat free and totally delicious, with legumes and grains for protein and fiber–they’re vegetarian but one could add lean meat and they’d probably be even more satisfying. Let me know if you want me to email you my favorites. Also, I swear by oatmeal with dried fruit for breakfast–sometimes I’ll make a vat of steel cut oats on Sunday night and eat it throughout the week (more fiber than rolled oats). My sisters and I swear by these. Like the Kashi bars, high in protein, low glycemic, high in fiber and great for the “inbetween” periods. Hilly and I love the Caramel Nut Brownie ones. LUNA does not contain any artificial sweeteners, colors or preservatives, high fructose corn syrup, trans fats or hydrogenated oil. Sometimes, a whole one is too big, so I split them in half. They also have mini bars. Like Kat, I too will try the kale chips this weekend and report back. I cant wait to try the kale chips. I LOVE kale lately. Theyre really just greens for the upwardly mobile. Switch to diet mixers – diet jack and coke/rum and coke are my bestfriends. But remember that fake sugar does the same thing to your metabolism as real sugar, just w/o the calories. Cheat on omelettes/scrambled eggs by using 3 egg whites with every one egg. Instead of pouring salad dressing on the salad, dip your fork into the dressing before picking up each forkful. Always make your plate 1/2 vegetables and eat that half before the rest (1/4 carb, 1/4 protein) – imagine it as a big pie or something. Frozen fat free Jello pudding is THE BOMB. Take the skin off of chicken for the love of god. Thats all for now. Good luck! Aliya, kale chips?…look yucky but I gotta try them. I’ll anything once. This week has been better than last few weeks. My trainer & I have set a goal yesterday for Easter (down one dress size) & I am sticking to it. Last week, I was traveling all week & thought I was eating pretty well (didnt have time to workout but my trainer swears I could have found the time somewhere…if he ONLY knew), however, after my weigh-in on Monday AM (what a way to start the week), I had only lost ONE WHOLE POUND…WTHeck?!? Weigh-ins are once a month &, a week before the weigh-in, I had lost five pounds (according to my scale). Talk about a huge disappointment to say the least. Let me be totally honest with you, I wanted to go eat a WHOLE bag of jelly beans (my newest obsession). I talked honestly with my trainer & we realized what happened together. I hadn’t ate enough (how CRAZY is that?!?) & I ate dinner too late in the day each & every night (nothing I didn’t already know). I would start the day off right with oatmeal & the day would quickly go downhill from there. Lunch served at the meetings was usually some kind of sandwiches, potato/macaroni/pasta salad and cookies/brownies/cheesecake. I HATE sandwiches so I would eat a lil potato/pasta salad & a cookie/cheesecake. I brought healthy snacks with me & they would round out the rest of the afternoon, however, dinner wasn’t any earlier than 8 every night & bedtime was much later than usual. Well now I know & knowing is one third of the battle. Because of this, I am working harder to meet my next goal!!! Whew, just lifted a HUGE weight off my chest (no pun intended). I had been fuming about that ONE POUND all week. Thanks for letting me vent in obscurity…wink wink. I cosign on the Luna bars. There is lemon one that I love. And Luna bars apparently contain lots of good stuff for women. Hoping to try the kale chips too. Thanks for sharing. I’m doing better. I have been bringing lunch to work with me. Wifey has been working with me, making sure I don’t leave home without it. However, we both over slept the other day. I went to work with no lunch, and I dipped. I could’ve grabbed a salad, but No.1 always slips out at the drive through. Large. But I’m working at it. As for healthy alternatives, I did a full switch to soy milk. And the Kashi people make a good cereal, Called U, has granola, black currants, and walnuts. Banging. Has Omega 3, protien, fiber, and all that good stuff. Good luck Li! I’m tryin’those kale chips! They look good! Ok…As I write this I feel like I have betrayed myself and all of my gym trips this week. I had a bowl of ice cream(cookies and cream). I blame my oldest home from college who pulls out a container of Haagan dazs dulce de leche…the baby wants her icecream and it was all too much for my will power. I drink the crystal light, but I am sure after years of diet soda I am immune to the headaches. I love water, but get bored with it. Just thought of something as I brushed my teeth….I have a toothbrush and toothpaste at work. brushing my teeth at works stops me from eating. I will not nibble, especially if we have vendors who bring in food if my teeth are freshly brushed. I am going to try some of the bars you all mentioned and see how I like them. My lunch this week has been salad and tuna and the dressing in the spray bottle makes me use alot less. It has taken me a long time to start eating healthier, but I’m a lot better now and I feel so good about it. I started off slowly, trading in fried fish for baked, same for chicken. The George Foreman Grill is like my favorite cousin, and I force myself to eat mixed veggies. I eat a lot of ground turkey/chicken, because that’s cheaper and well…I’m still training to be rich. I cut out fast food for the most part, outside of the occasional trip — although it’s very rare these days. And even when I do go, I try to steer clear of fries, and op for something grilled. Chick-fil-A is my friend since they at least fry in peanut oil. How I miss thee. Anyhow, I usually give myself one day to ‘cheat.’ It’s gotten to the point now where I barely exercise that luxury. I used to look like the Pilsbury Dough Boy and then morphed into a lanky guy, but I know my body and I realized that if I continued eating junk it would catch back up with me. So many larger older people have come up to me like, “I used to be your size.” Eek. Good luck, Aliya. You can do it! KALE CHIPS!?!?!?!?!? OMG! Will have to try this with my 2 year old…he is soooo picky, we’re still pureeing everything. Stay away from the sugar substitutes, go with the real thing, just in moderation. I’ve been dieting myself, I hate to say, but its working…lost 12lbs since January and that’s with no exercise and with some “cheat” days. The diet focuses on lots of vegetables, proteins, fruits, very little carbs, and of course lots of water. I snack on nuts, cheese slices, fruit. Basically I’m really strict for 11 days and after the 11th day I get 3 cheat days, so that’s 3 days every 2 weeks to eat WHATEVER I WANT…lol…it is currently a cheat weekend for me. Anyway its working and not as bad as I thought it would be, and I think I’ll be able to maintain it and incorporate the principles into my lifestyle. We’re all on this journey with you honey….3 more pounds and I’ll be at my ideal weight. Food is STILL my lover. I try hard not to think about him but a smile comes over my face whenever I do. I actually get excited thinking about my next meal. Am I crazy? Can I be hypnotized? What can I do to get him off my mind? The wii has been fun but I don’t get on it as much as I should. When I step on the board it says ‘Oohhh’, like I gained weight, grumble, grumble. As soon as the weather breaks my plan is to put the lil one in the stroller and go for long walks after dinner. I love to walk but don’t like the cold so the weather has to be just right for me to venture out. Roasted cauliflower and squash is good. Same cooking technique as the kale. Try Quaker mini delights, I recommend the caramel drizzle. Tried Kashi once but never heard of Luna. Need to write down the tips recommended and head to the grocery store this evening. Planning my meals really works but have not done a good job over the past two or three weeks. At my last weigh in at ww I dropped over 4 lbs but I think the scale was faulty. I’ll have to try the kale chips. I do the same thing with asparagus. We call it crunchy asparagus (the tips get particularly crunchy! ), and my kids and I snarf it down like snack food. As for the workout — I run. I agree with the Weight Watchers recommendation, but you can accomplish the same thing by journaling and watching calories. Being honest with yourself about what you are eating, when you are eating it and why, helps you stay in control. Good luck!